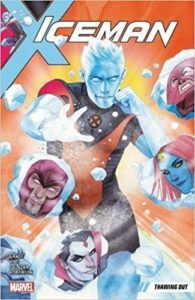 As I sit here on our first school snow-day in two-years, I find it only apropos that I bring you a review of what is sure to be a new Marvel classic in Iceman: Thawing Out. I have not enjoyed a Marvel trade this much in a while. As my knowledge of hero books grows over the years, I love it when I get to explore a character that I didn’t know that much about that turns out to be fantastic. I mean, I know who Iceman is; I grew up watching Spider-Man and His Amazing Friends, but I’ve never known the character that inhabits the pages of this trade. Bobby Drake is funny, tough, intuitive, and brave. But what Bobby is most is vulnerable. A trait that is very becoming in a hero. Let’s start with the fact that Bobby has parents that are not pleased with the fact that he is a mutant. They want a “normal” son, one that is not on the news, using strange powers to save the world on the daily. And by the end of the trade, when he actually finds the strength to tell his parents that he is gay, they try to distance themselves from him even more. So yes, this book is about a guy that has power beyond his comprehension, but it’s more about a guy that is trying to live up to a non-existent ideal that his parents have set for him. Earlier, Bobby had written a letter to his parents, telling them that he is gay, but he did not send it yet, so when he storms out of the mansion to fight Juggernaut in Central Park, we get a beautiful sequence of Bobby fighting a Juggernaut while we get captions of what the letter says, as his parents read it. As the letter progresses, Bobby begins discovering his true power, and by the time the letter is done, Bobby has discovered power beyond what he thought possible. A wonderful metaphor juxtaposed with his parents finally knowing his true feelings. I’ve said too much about the book already, but you really should check this one out. It’s powerful comic story-telling sprinkled with great action and wonderful character development.